THE POWER OF STAYING CONNECTED! Since your first day of class at Escuela Americana, you became part of the EA Family. After 14 years, you left behind memories, friendships and teachers that are a part of your life. Escuela Americana wants you to come back to your school and remember all the wonderful years you spent as a student; all the marvelous things that you learned; and what helped shape you into the person that you are. 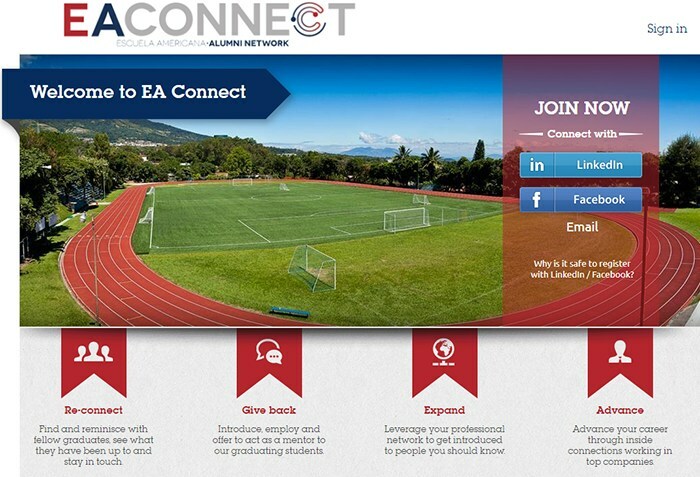 The Alumni Office wants to be the link to help alumni and parents stay connected to EA. With approximately 6,500 alumni, EA is finding its former students all over the world! There is no bigger satisfaction for a school than to have its former students come visit and participate at school organized events. These pages are dedicated to connect with you and to provide a link between our large alumni community and Escuela Americana.